Three springs ago I visited the Leopold Memorial Reserve—the depleted Wisconsin sand county farm Aldo Leopold bought in 1930 known as the “shack.” In the 1940s he recorded in his field notes that without large predators such as wolves to regulate their numbers, deer were eating aspens and other trees and shrubs to death. I wanted to see whether this was still so. The Wisconsin River where it flows near the shack, at flood stage. Photo by Cristina Eisenberg. 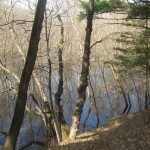 The 1900 acre Reserve lies along the Wisconsin River, half in floodplain and marsh, the rest in upland oak-hickory-pine forest and old farmland. Deer densities range from 5-11 per square mile, 150 to 300 percent above management goals. Predators include coyotes, with occasional cougars and black bears. Several wolves have been sighted in recent years, dispersers from northern Wisconsin. These wolves sometimes turn up as roadkill or shot by farmers and hunters. When one was shot near the Reserve a few years ago, the Leopold family mourned its death. Although no established wolf population exists here, more wolves are coming from the north. The terrible condition of the aspens at the Shack. Photo by Cristina Eisenberg. 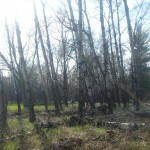 I surveyed the Reserve’s aspen stands and found many being eaten heavily by deer. Prescribed fire had stimulated vigorous aspen growth; however, this had only intensified browsing, leaving stands in worse condition than if they hadn’t burned. One day Aldo Leopold’s daughter Nina joined me in the field. Her chocolate Labrador retriever Maggie ran glad circles around us as we examined the aspens around the shack. As we looked we became aware of missing age classes and ghosts of trees likely long lost to herbivory. “Look,” I said, gesturing toward the aspens, “Lots of old aspens. Lots of young aspens. No middle-aged aspens.” Next we examined the aspens below the height deer can eat (about six feet). Almost all had sharp, chisel-shaped ends where the deer had bitten off the dominant growth bud. I examined an aspen less than three feet tall and counted its wounds—eight in all. Aspens can sustain moderate browsing, but these Bonsai trees would eventually die. We looked hard, but couldn’t find stands near the shack with aspens growing above browse height. Across from the shack in Crane Marsh, aspens grew above browse height. But this area contained rough terrain impassable to humans and difficult for even deer to navigate. When I finished all my fieldwork, I sat on a mossy bench overlooking the Wisconsin River floodplain. It was Earth Day. The sun slanted low across the water and illuminated the white pines planted by the Leopold family. Now grown tall and stately, their boughs swayed gently in the wind. The weather forecast promised snow the next day. I sensed the earth burgeoning with life on that warm afternoon between storms, everything green and growing. Now and then I spotted the bright feathers of returning warblers, flying low between the oaks, exhausted from migration. Perhaps Aldo Leopold had sat where I sat, hearing cranesong from the marsh, a light wind playing through the previous year’s dried grasses, leaf buds beginning to open after a long, hard winter. Perhaps he had sat here and thought about his struggles as a game commissioner grappling with too many deer in Wisconsin, or about how to sharpen his writing skills to communicate more effectively about conservation. Perhaps he had found hope that his words would open hearts and minds, that his restoration efforts might bear fruit, and that his children would carry on his efforts. And so they have, and the wolves are returning. There is a great clarity of light here.